For my birthday, my husband took the day off, and we spent the afternoon in the Los Angeles Jewelry District. If you love jewelry, we have this in common! Before we get into the details about our day, you’ll want to visit my Jewelry Shop! Shop for 14-18k gold and diamond pieces just like you would find in the jewelry district but from the comfort of your own home. Unlock a 10% coupon. Each piece was carefully selected to match a woman with casual elegance and style. Our prices are competitive without the traditional retail markups. We are so confident you will love the pieces in the collection for its quality, value, and style that we offer a 30-day refund policy. Back to the Jewelry District! My husband and I have this tradition where he and I play hookie on my birthday. We always do something fun, just the two of us. I love it. My friends had a surprise Belly Dancing Party for me this year which was a blast! And did you see my post about my friend’s surprise YOLO Bday Dance Party? So fun! We visited a few stores at the LA Jewelry District and then had lunch at Bottega Louie (which is a block from the Los Angeles jewelry district). It was a great day. Jewelry is my specialty. My parents and grandfather were jewelers in South Korea. My mom tells me that my love for diamonds stems from being in her womb while she was in gemology school. You will find lots that charge $4 every 10 minutes = $24 for an hour! Expensive, right? I park for a flat $15 in a lot on Hill Street just before 8th. There is no time limit which I prefer. 2. Know which stores you will visit in the Jewelry District. You really need to know where you are going and what you are looking for before you visit the LA Jewelry District. Otherwise, the number of places to shop can be overwhelming. An important note: Unless you have a wholesale license, even when you shop at the jewelry district, you will not be charged wholesale prices. Vendors will charge individual customers a mark-up from wholesale. You will be paying less than traditional retail of 2.5x wholesale, but don’t be fooled into thinking you are getting the same price as wholesale vendors. Where you shop will depend largely on what you want to buy. I was on the hunt for gold bangle bracelets to complement my existing diamond bracelets. Check out the gorgeous choices of gold and diamond bangles at SN Queens. Keep in mind, a good jeweler can make any design you want. But generally, this will take about 4 weeks and there will be less room to negotiate on price. 3. Know the general retail prices for what you are looking to purchase. What is the general price of gold? Do you want 14k or 18k? Maybe platinum? Titanium is less expensive than gold and a very strong metal. What is the price of diamonds in the size and quality you are looking for? What quality is acceptable to you? Knowing this information puts you in the best position to find and get the price you want. Higher end jewelers like to use clarity SI 1s for their bracelet diamonds, even when using small stones. However, you can go down to SI 2s without compromising sparkle. I was looking for eternity diamond bangles at the high end of my budget. I did some internet research to get a general sense of price before we started our day. This bracelet (left) was for sale at Capri Jewelers for $4500. I was in love with it! But we passed, as this was more glitz than we were looking for. Appraisal and Diamond Quality Certificates are not necessary for diamonds less than 1 carat. Jewelers like to tout these certificates to support the value of what they are selling. They are generally worthless. For diamonds more than 1 carat, I rely only on GIA certificates. 5. Work with jewelers who understand your style. There are traditional jewelers in the Los Angeles Jewelry District who focus on basic and timeless pieces. But there are also jewelers who are more artistic and current with their jewelry styles. I love to find new pieces that are unique and current, yet elegant. Generally, this is based on personal style, but when you walk around the jewelry district, you get a sense quickly by the vendor’s existing inventory whether they match your taste. The downfall of the jewelry district is that there are so many vendors – you have to walk around for a long time and see who suits your style. It can be overwhelming. There is definitely a value of being able to visit one central source to find the pieces you’ll love. What is your jeweler’s maintenance service? Warranty? Can you return the item? Can you upgrade in the future? How long have they been in business? You want to be confident that the merchant will be around when you need them. All are important questions to ask before you purchase. Generally, don’t buy jewelry at a brick and mortar retailer unless you are buying something very specific which only that retailer sells. If you are buying a diamond tennis bracelet or band, go to the jewelry district to get a lower price than retail. Prices will be about 40% less than the prices at retail stores. Have I purchased retail? Yes. I have purchased from Tiffany’s and Van Cleef & Arpels but I definitely paid a large premium. My recommendation (if you can) is to go to the Los Angeles Jewelry District to purchase loose stones and pieces for which you already have an idea of the design. If your budget allows, go to boutique retail stores for the designer or one of a kind, higher-end pieces and when you want more consultation. Have you visited my online jewelry shop? Check out my collection of gorgeous pieces I’ve hand-selected from the Los Angeles jewelry district. They extend the same wholesale rates they give to jewelry retailers to me, due to my readership following and of course, wholesale license. 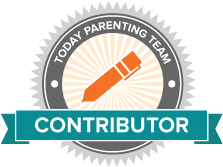 Without the overhead related to having retail stores, I’m able to pass the savings on to you! 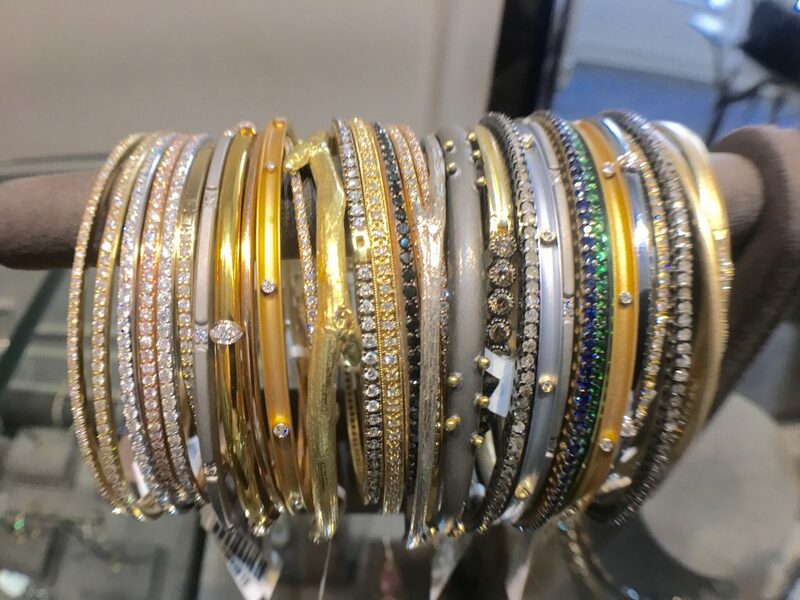 We found these 18 karat bangles at Capri Jewelry. There was one in rose gold and one in white gold. They have a cluster of diamonds every third portion of the bracelet. I love the pounded metal in matte finish. The asymmetry of the metal gave these bracelets a very hip look to balance out the traditional pieces I already own (Van Cleef & Arpels white gold and diamond bracelet, and a white gold eternity diamond bangle). We worked up an appetite while visiting the stores. Luckily, we found Bottega Louie on our way to the car. The vibe of the restaurant is hip like restaurants in New York City, with high ceilings and a large open space. We had the most delicious lunch. There is also a dessert counter with all kinds of delectables. Each dessert is about $15, so pick a good one and savor it! So now you know where to shop, park and eat at the jewelry district. What more can you ask for? I hope this helps you find the piece you’ve been dreaming about! Don’t forget to also check out my online Jewelry Shop! If you enjoyed this post, see also my posts on How to shop for gold jewelry and how to style jewelry with your outfits!